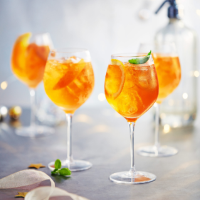 Pour the Aperol and fizz into a glass full of ice. Top up with ginger beer. Garnish with slices of orange and basil leaves. Put 40ml Aperol, 20ml lime juice, 15ml sugar syrup and the pulp from ½ passion fruit in a large wine glass filled with crushed ice. Stir well and top up with Prosecco. Garnish with a lime wheel. This recipe was first published in Fri Dec 09 13:37:00 GMT 2016.